The town of Harleston was largely set up during the 13th century within the parish of Redenhall, and as such has not received a large church of its own. As a result the church of St John the Baptist is a 'chapel-of-ease' and dates to 1872, and its architect was Phipson, with the stained-glass a single commission from the O'Connors. 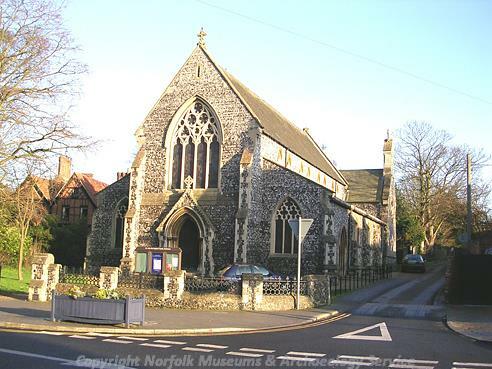 The church itself is constructed from regular Victorian knapped flint with stone trim. Inside, most of the O'Connors glass remains, with some modern stained glass depicting the local landscape and the church's patron. The west window, of original glass, was restored in 2010. 19th century. The apse roof has slate rools that look very like those on the chapel at Gressenhall Workhouse, which are said to be of great rarity. See file for architect's drawings and newspaper cutting (S1). NGR corrected from original TM 2442 8338. M. Horlock (NLA), 27 August 2003. The west window is successfully reinstalled following restoration. E. Whitcombe (NLA), 6 August 2010. --- Newspaper Article: Eastern Daily Press. 2010. Church window restoration work is almost complete.. 1 July. --- Newspaper Article: Eastern Daily Press. 2010. New lease of life given to stained-glass church window. 30 July. <S1> Newspaper Article: 15 April 198. Eastern Daily Press. <S2> Newspaper Article: Eastern Daily Press. 2010. Church's window to shine once more. 29 April.